You may be asking yourself, does your skin actually benefit from using a serum? And, the answer is definitely yes! But how do serums differ from normal moisturisers? The difference is that serums actually contain fewer ingredients than your everyday moisturiser. But that isn’t a bad thing! They don’t include the moisturising ingredients that prevent water from evaporating, and contain less lubricating and thickening agents. This leaves them with a higher concentration of active ingredients. Serums are also made up of smaller molecules than a thicker moisturiser, so the skin is able to absorb them quickly and more effectively. 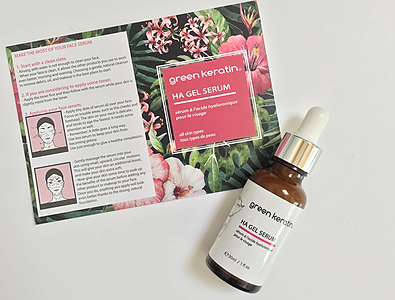 If you are suffering from the damaging effects of dry skin, then you need the Green Keratin HA Gel Serum in your skincare routine. When your skin is dehydrated, it is more likely to worsen the appearance of fine lines and wrinkles. This is why it is so important to stay hydrated. And although the health of your skin starts from the inside, there are ways you can protect and repair it from the outside too. The HA Gel Serum is potent and clinical strength, helping to fight off the appearance of fine lines and wrinkles by providing the skin with intense hydration. As we age, it’s important to keep the skin moisturized. This is because as we age, the skins natural moisture decreases, causing the skin to lose its elasticity which intensifies the signs of ageing. So, moisture is a maturing skins best friend, which is why this serum is so effective. It contains 20% Hyaluronic Acid Gel, a mixture of Hyaluronic Acid Concentrate and water. This is one of the most loved moisturising ingredients in the beauty industry as it is able to bind up to 1000 times its own volume in water. Vitamin B3, also known as Niacinamide, is the other essential ingredient of this serum. This B Vitamin has tons of great benefits for the skin. It assists with the moisturising and anti-ageing properties of the Hyaluronic Acid Gel, whilst also helping to improve overall skin tone. It does this by reducing any hyperpigmentation while smoothing the surface of the skin. One of my favourite ingredients in this serum is the Organic Aloe Vera Juice. This is not only great for retaining moisture, but it also has a really soothing effect on the skin. It means that as soon as you have applied this serum, your skin feels light and fresh! This serum works best on a cleansed face, following your toner. A general rule for the order of your skincare routine should be to move from the thinnest to the thickest products. This ensures that your skin is able to absorb all the products properly. Apply drops of the serum all over your face, while your skin is still damp from your toner, focusing on key areas. Don’t forget to also apply some to your neck, as the skin here is incredibly delicate and tends to age the fastest. Gently massage the serum into the skin using small, upward motions. These motions will give your skin an extra little boost, leaving it feeling radiant and healthy! 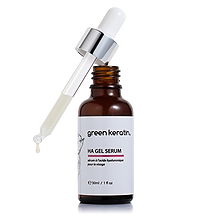 This serum is 73.35% organic, suitable for Vegans and Vegetarians, and also cruelty free. And, it is suitable for all skin types. It doesn’t get much better than that!